Comfortable, clean family accommodation in the heart of Blackpool. The New Hampshire is a family run hotel in the very heart of Blackpool. 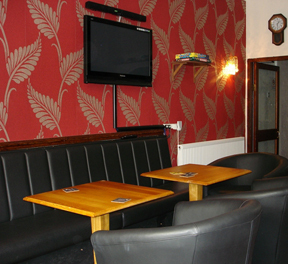 We provide a full English breakfast or lighter options, and offer a good home cooked 3 course evening meal. We have 10 bedrooms all are ensuite, 5 on the 1st floor and 5 on the 2nd floor. We have a selection of 8 double and twin rooms. The bedrooms are stylishly decorated, all with matching bedding and curtains. The bedrooms have tea and coffee making facilities, clock radios, with iPod docking, smoking and non-smoking rooms and central heating. Our bar/lounge provides every comfort to our guests, for you to enjoy your favourite drinks during the day, with your evening meal or as a night cap. You can unwind and enjoy pleasant conversation with members of your party and other guests staying at the hotel. © 2014 The New Hampshire All right reserved.